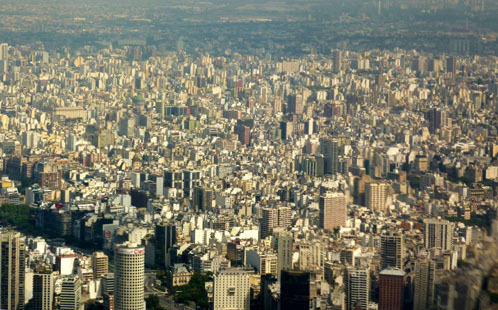 Buenos Aires is huge; coming in by air you sweep over this huge white city of towers and it seems even larger due to its isolation. There has been hardly any towns or cities of any notable size for at least the last 3 hours, and at 500 miles an hour that’s a long way. Greater Buenos Aires is like a giant number 7; at least in terms of what the visitor will be interested in, and what I’m going to gloss over in this Postcard. 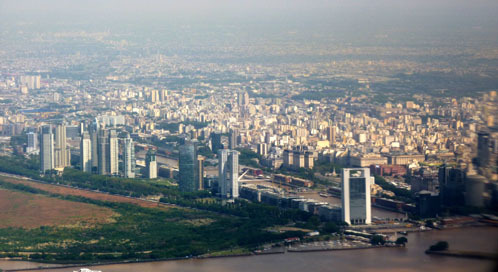 The corner of the 7 is the city centre, the lower parts (going down and south) contain San Telmo, Puerto Madero and down at the base: La Boca. Pretty much the same area really, the main road running through is the pedestrian thoroughfare Calle Florida which is one of the main shopping areas. I thought it was a bit tatty and the street is filled with casual (and probably unlicenced) street vendors most of the day and in to the early evening. They sell tourist tat and cheap clothes in the main – nothing much of interest. Several of the large stores in the area are closed and abandoned, including one that was called Harrods (no relation I think). The feature shopping centre is Galerias Pacifico, which is about the only place in BA that I encountered chain stores, otherwise BA was refreshingly free of global brands. Galerias Pacifico is touted as ‘the place’ to visit, but it’s very mainstream and contains not much of interest if you are from Europe or North America. 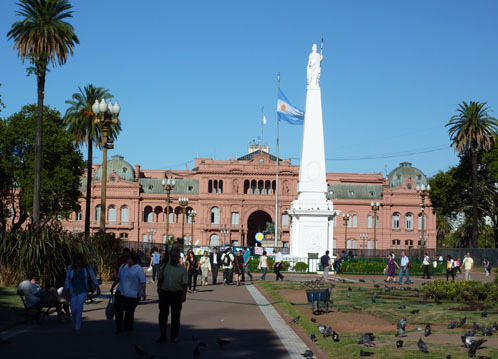 The central area contains some impressive architecture and at the Microcentro is the Plaza de Mayo (commemorates the 25th May 1810 independence from Spain) with the Casa Rosada (Government House) at the eastern end. 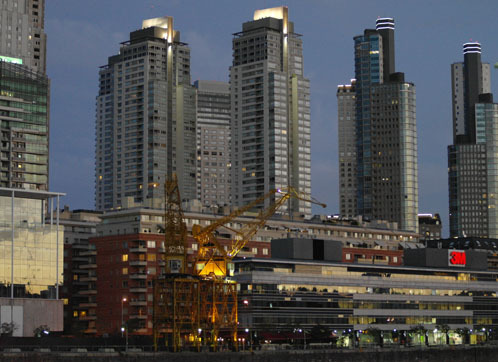 Puerto Madero lies further east of here, behind the Casa Rosada. 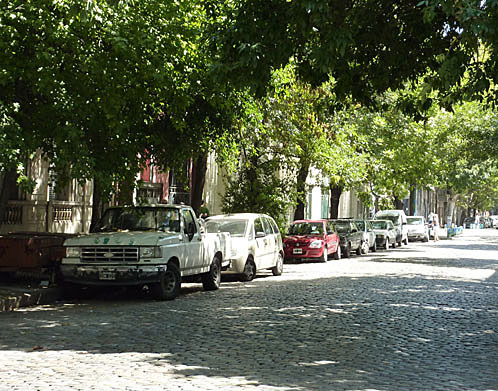 Walking south from Plaza de Mayo, there are a few streets with government buildings and then very soon you are in San Telmo and the mood changes. This is one of the older parts of the city and whilst its fortunes have waxed and waned, its currently on the up, helped by the fact that it has attractive buildings, surprisingly wide cobbled streets and (at the moment) is a bit cheaper to buy in than some of the more upscale areas to the north, its becoming quite trendy for cutting edge shops and bars; think SoHo New York in aspiration – although its much more low key and friendly in practice. I found this really good street market that was beautifully set out, then I noticed the cameras… it was a film set… Oh well, the area is still very good for a wander. 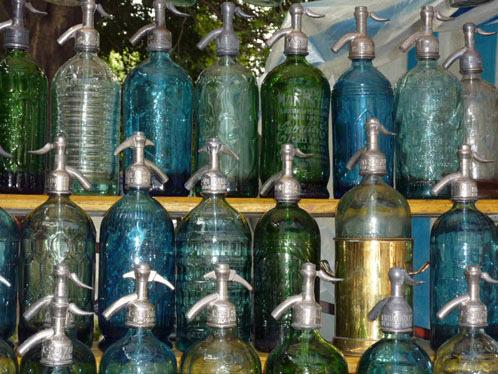 San Telmo is also the home of the (real) Sunday antiques market at Plaza Dorrego; this is quite touristy but does have real antique stalls and shops (of varying quality) and the whole area comes to life with a lot of street activity. There are lots of bars and restaurants in the area so its possible to make a whole day of it. 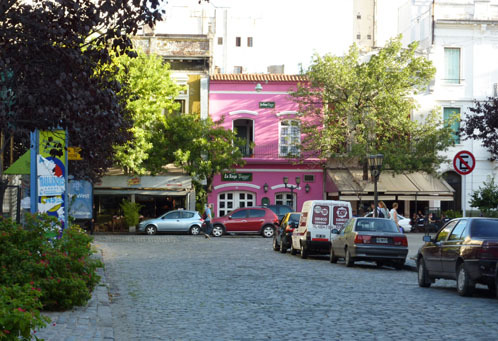 Some streets on the eastern edge of San Telmo can be a bit dodgy after dark – so caution advised. At the southern tip of the BA 7 (at least for the purposes of this Postcard) is La Boca. 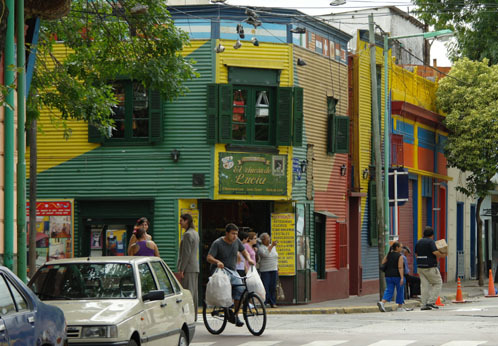 If BA has a tourist trap then this is it; there is no other reason for a visitor to go to La Boca apart from to see what has been manufactured for them. 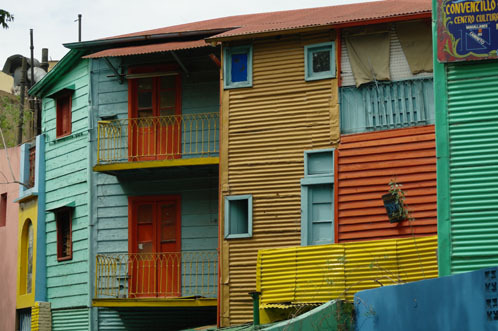 La Boca (the mouth) is the port area, the story goes that the residents were so poor they were only able to paint their houses with odd bits of paint left over after ships had been renovated; hence the rather eclectic colour schemes this part of town is famous for. 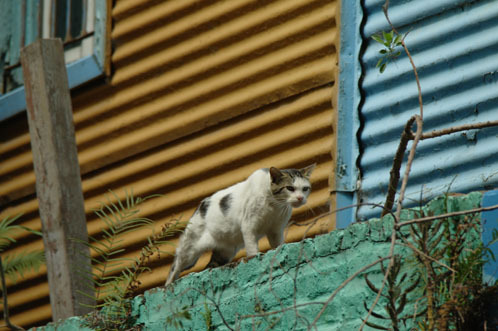 This story may well be true, and La Boca certainly smells like a port, but the street you will visit if you come here (El Caminito) is rammed with tourist rubbish from beginning to end: paintings, pots and pans, spoons, plaques etc etc. You can have your photo taken with a Maradona look a like or any number of Tango dancers (who will lend you an outfit to add authenticity). It’s hard to blame them really, there are few opportunities for work in this part of town, so why not milk it. 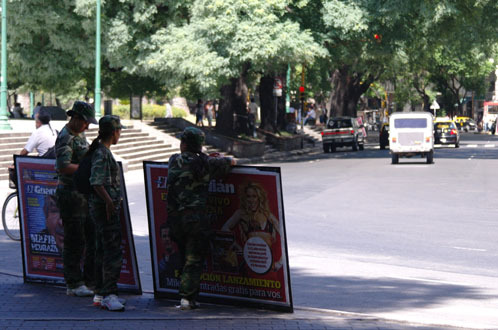 A warning: do not stray far from the crowds on the waterfront or on El Caminito – and get a taxi or bus in and out. Whilst the touristy bits are legitimately relieving folk of their cash, other streets might lead to cash extraction of a different kind. A seperate warning concerns this track that looked disused to me, there are a lot of disused tram tracks throughout the cobbles of BA and I thought this was another one. 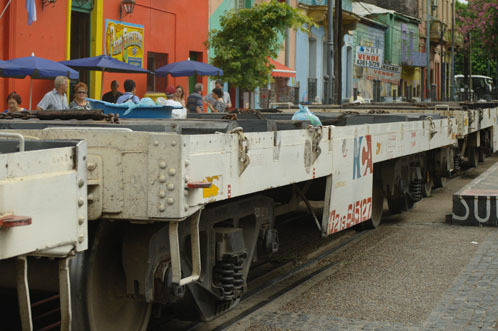 Turns out its not disused – this heavy goods train just passed straight though the crowds with little warning. 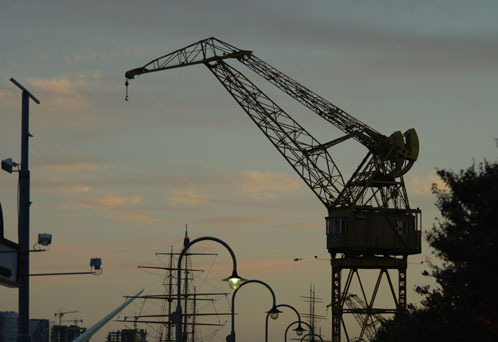 The revived docklands of BA. There are some renovated buildings along Ave Alicia de Moreau de Justo most of which house restaurants, but otherwise the area is brand new. Vestiges of the areas history add interest and its an atractive area to wander around. Lots of fashionable restaurants which get very busy in the evening; can be quite dressy. At the northern end of Centro is Retiro, difficult to say exactly where it starts as the first streets still contain shopping. Whilst the northern end of Retiro contains some very smart apartment blocks, the part edging on to Centro is not particularly tidy, although the shops are a bit more upmarket. 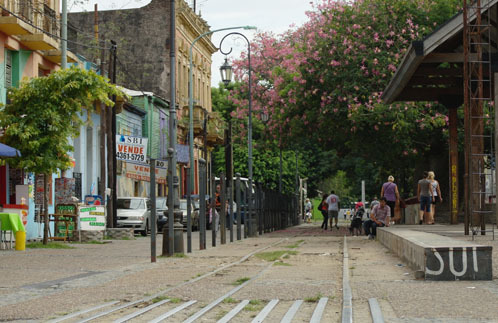 Being situated where it is; between office land and home land, there are a couple of streets that fill up with office workers in the early evening: Reconquista (around Paraguay). Special mention to a Parrilla here: Al Carbon, Reconquista 875. Excellent service and food, highly recommended. 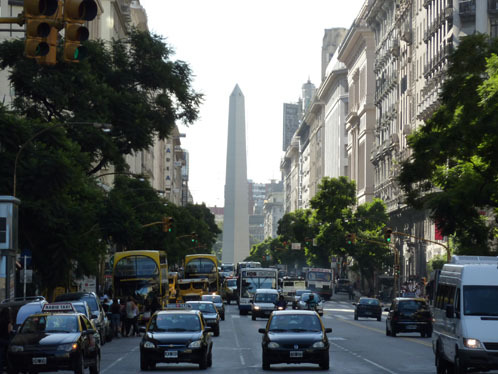 Some good leather shops facing the Plaza San Martin and on MT de Alvear, look for the shop called Welcome, good collection at reasonable prices, this is more unusual than you might imagine for a country that has as many cows as Argentina must have. At the centre of Retiro is the Plaza San Martin; an attractive green area with an imposing tower at the end, this used to be called Torre de los Ingleses, after that spot of bother we had a few years ago was named Torre Monumental (although no one seems to call it this), for anyone unsure as to ‘the bother’ there is a memorial to the fallen Argentines of the Las Malvinas conflict facing the tower. 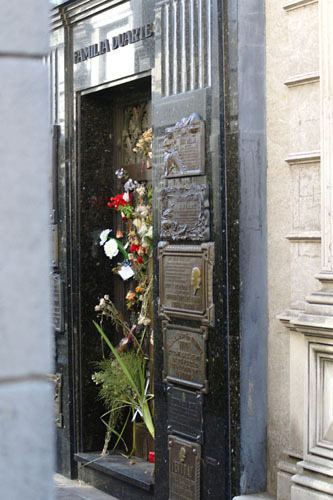 Moving west along the top of the BA 7 is Recoleta; the smart bit… Smart shops, cafes, restaurants and of course smart cemetery; containing Eva Peron; aka Evita, of the family Duarte (the tomb is under the family name if you go looking for it). 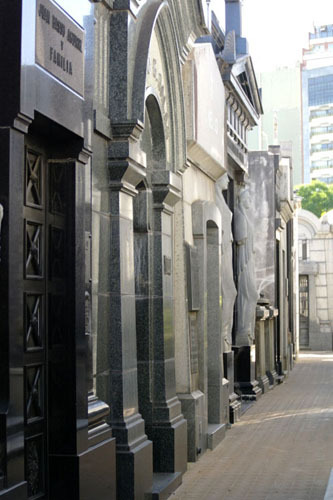 The cemetry is quite compact and as befits these places, quite tranquil, Evita is over on the left hand side, you will find it easily and there are plenty of people who will show you – although it was quiet on the day I visited. Last stop west on the BA 7 (at least for this Postcard) is Palermo; my favourite part of BA. Most of the streets here are cobbled and tree lined, and incredibly wide – I have no idea why the original planners allowed for this width of road. The area is full of bars, restaurants and shops, but very laid back – I never felt crowded or hustled; down to the space again I suppose. 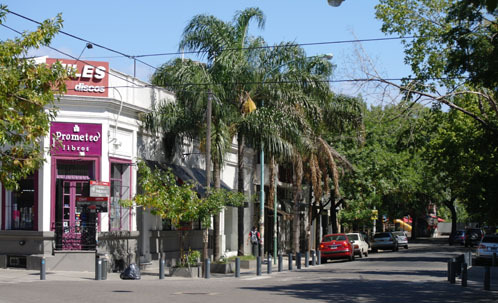 In terms of areas Palermo is one of the largest barrios of BA and much of it is residential. 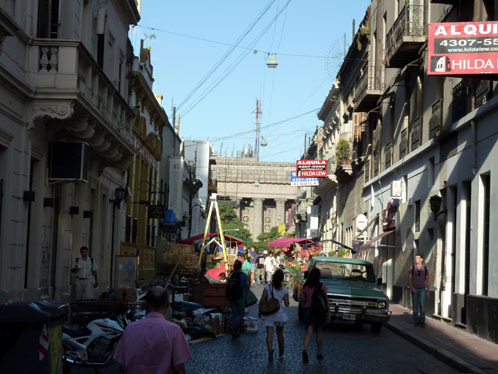 The part where shopping and night life goes on is Palermo Viejo, which is further subdivided in to Palermo Soho and Palermo Hollywood – these are side by side, but seperated by a railway line: Honduras is a crossing road, so use that to get between the two sides. There is way too much going on in this area to start listing places, but Honduras near Gurruchaga would be a good place to start. Great shops in this area too. This is a large city and I’m sure has much to offer, whatever I experienced was only a small part… However; most meals were good rather than great, the quality of meat – and in particular beef – is exceptional, and there is a lot of it. Parrillas (grills) are everywhere, and prices are good; a steak twice the size you would get in the UK comes in at about £7 – 8 with salad and potatoes. Mashed potato is quite popular with grilled steak, you will need to ask for fries if you want them. Ingredients good, cooking mostly fairly simple: grilling or frying… Restaurants open 1 – 3 ish at lunchtime and 7 – 1 at night, eating is late, but nothing like as late as in Spain. Coffee bars are everywhere, especially Palermo, and these often serve snacks and small meals. All will have medialunas (croissants) in the morning and often a few other pastries as well. You always get a glass of water with a coffee, often a biscuit and even a small sample of ice cream, prices are good (£1 – £1.50 for a coffee). There is an old style BA bar that can be found in areas like San Telmo, La Boca and parts of Palermo an example below, hard to describe but the feel is unique to BA – all have similar furniture, and I have never seen the style anywhere else. Drinking bars keep differing hours depending on their clientelle: after work, pre club etc, and so its worth checking if you have a destination in mind. 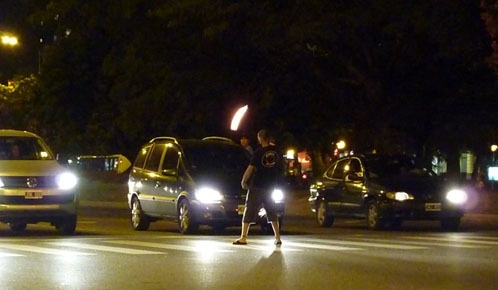 Clubs are late, don’t expect many people to be there before 1.00am. 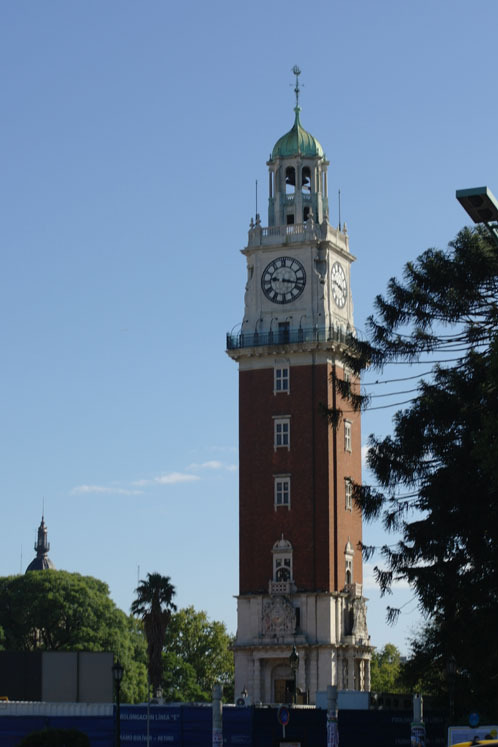 Buenos Aires is famous for it’s dance: The Tango. This is taken very seriously and some people (you know who you are) come here specifically to dance it or to learn it better. I was taken to a Milonga to see Tango in action, and if you are in the area you should go and see it too. The metro system in BA is fairly limited, comprising a few lines fanning out from the centre, these seperate out and miss quite large parts of town as you move out – for example: Palermo is between 2 lines, but too far from either really. 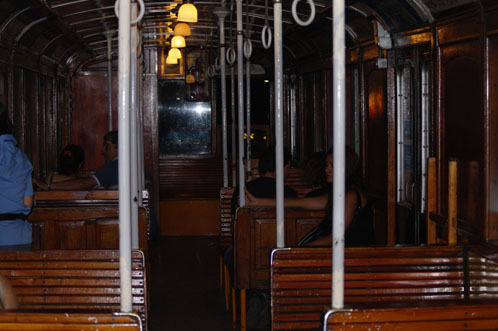 However; if you are in BA in the next couple of years, do try to have a ride on the A line from Plaza Mayo, at the moment they are still using the 100 year old wooden carriages, but they are to be retired soon. Otherwise: use taxis, I had read dire warnings about cheats, dodgy note swaps (for fakes) and not using the meter. I experienced none of this and every driver was polite and quite chatty, all of them switched the meter on without being asked and I thought fares were very reasonable. The note switch: everyone warns about this, I was even given a leaflet by a bank. What happens is you hand over a note, the other party switches it and gives a different one back, telling you its fake. How to avoid: memorise the last 2 digits of the note you hand over and make a point of announcing it’s value as you wave it. Another method is to build up a stock of small notes – that way you don’t need change. better than the squeegee merchants I suppose. The ultimate question is ‘will you go again’ and the answer is yes. 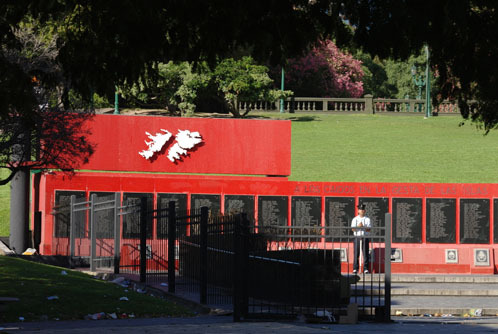 I really enjoyed Buenos Aires, and I don’t feel that I even scratched the surface. There is nothing of particular note that you feel you have to visit; sights and galleries etc, but its a great place to wander round and soak up the atmosphere, each barrio having it’s own distinct character. I stayed in the centre last time, and I think this was the right place for a first visit, next time I would go for Palermo. 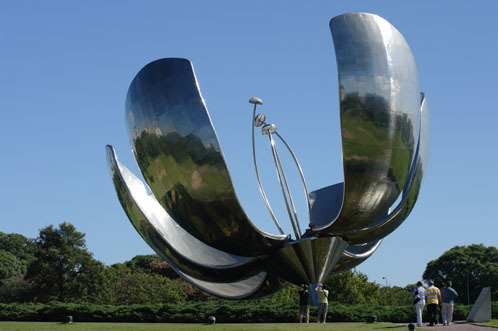 The other thing about BA is that it is a natural base for exploring the rest of Argentina and Uruguay, due to layout of the country most flights are via BA and its a centre for the bus network; this network is extensive and offers business class recliner seats, some of the distances are vast. Sick of the steak houses? 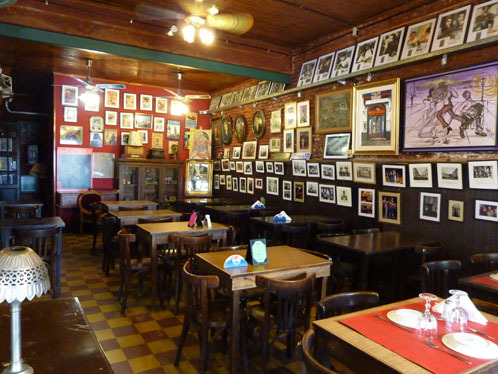 A growing trend in Buenos Aires is puerta cerrada restaurants – closed door restaurants. Many are BYOB and locations are disclosed when the booking is made. Details at saltshaker.net. Another recommendation (not by me, I’m just saving this) I Latina – Columbian restaurant in a town house.